The inspiring story of Nelson Mandela’s struggle for justice becomes a surprisingly uninspired musical. 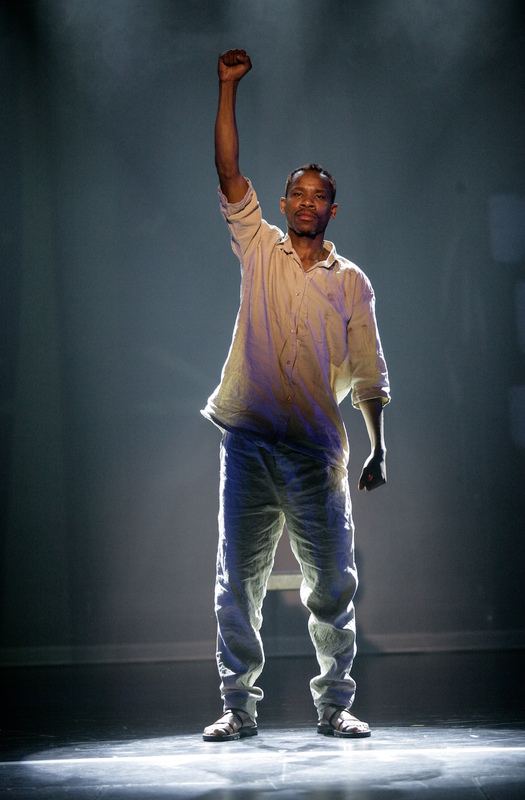 Starting in 2016 as a French production directed by Pierre-Yves Duchesne, Madiba the Musical’s first English-language production makes its debut in Australia under the direction of Dennis Watkins. The mostly local cast sings well, but in a show whose words and music are short on inspiration, they have limited material to work with. 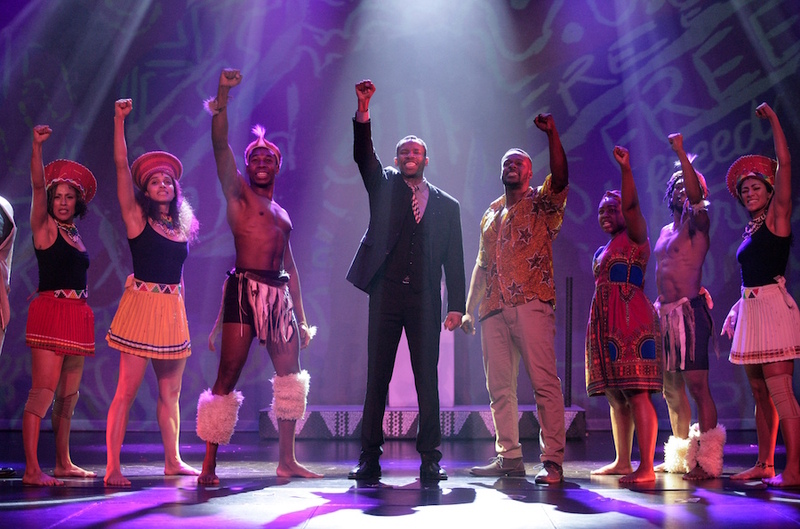 It’s surprising, even disappointing, that the powerful true story of the political struggle of Nelson Mandela and South Africa’s black majority could have such limited emotional impact on stage. Madiba, Mandela’s clan name, follows his fight for justice, beginning in the 1950s when he was one of South Africa’s few black lawyers. Representing his people in a justice system biased against the black majority, he turns to political activism and is imprisoned for life. During decades of incarceration, his patience and wisdom, and ability to inspire far beyond the prison walls, are revealed. After finally being released, Mandela becomes South Africa’s first black, democratically elected president. He is presented as an inspirational figure rather removed from everyday practicalities and passions. His wife, Winnie, is even more like a proverbial Greek god, dropping in and out of the action. The show’s emotional narrative is delivered by several other, interconnected characters. Sam, his wife Sandy and her brother William are political activists to varying degrees. Sandy’s employer Peter is a police officer both proud of and troubled by his white culture, while his daughter, Helena, opposes its racist attitudes. Her slowly blossoming romance with William is impeded by both apartheid laws and attitudes. The other principal cast member is the narrator, whose relationship with these characters is a nice reveal at show’s end. 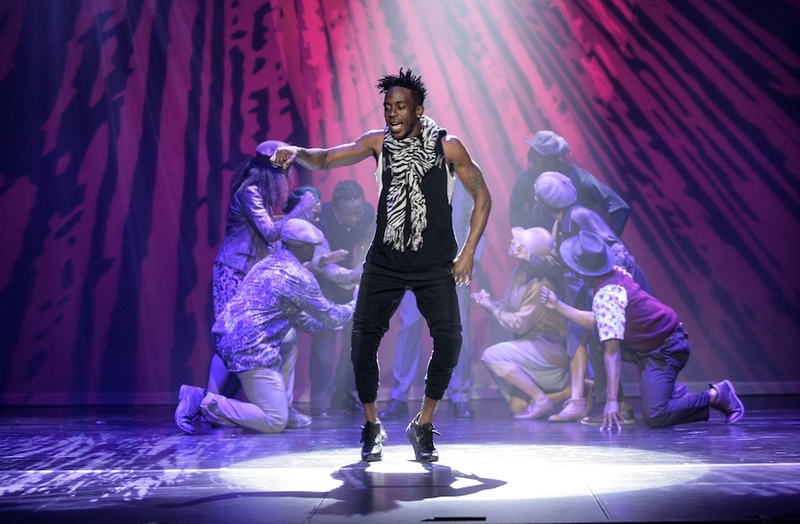 A contemporary figure who guides the audience through the decades with light raps and street-style dancing, this role is interpreted by David Denis. Occasional acrobatic moves such as horizontal leaps leave him speaking slightly breathlessly, and he also stumbles over his words a few times, but Denis remains an engaging, positive focus. Most of the cast have little dramatic material to work with, as dialogue is limited, but song after song, their voices impress: strong, pure and agile. As Winnie, Ruva Ngwenya is a particular vocal stand-out. South African Perci Moeketsi isn’t required to sing or dance much as Mandela, instead interpreting him with that distinctive speech cadence, serene air and words sometimes drawn directly from the great man’s writings and speeches. Mandela’s own words are the only ones that inspire in a show whose sparse dialogue is bland and whose lyrics are often unimaginative. Perhaps something has been lost in translation from the original French production written by Jean-Pierre Hadida and Alicia Sebrien. 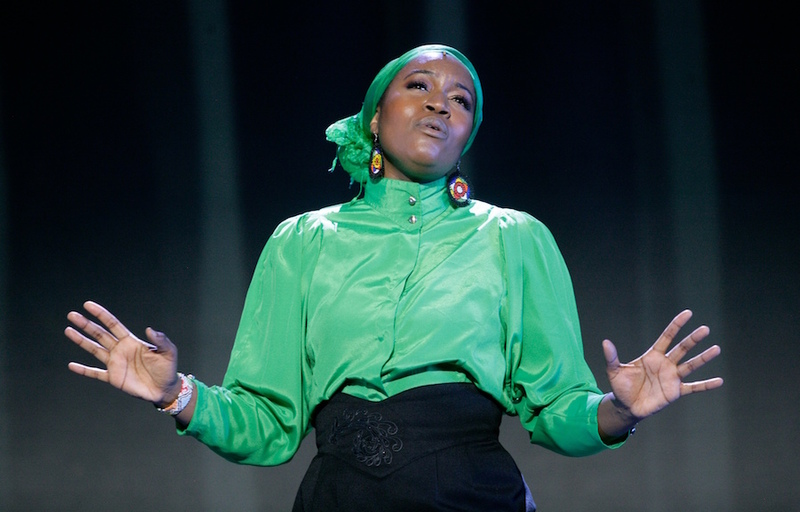 Hadida’s contemporary music is at its best when drawing on African rhythms, but this is all too infrequent, and the raps written for the narrator are lethargic. The few catchy or inspiring tunes are in the second half, which goes some way to redeeming a generally lacklustre first hour: Helena and William’s duet The Colour of Your Skin, To Live in Peace, which is powerfully led by Ngwenya, and the finale, Freedom. The dancers are lithe and energetic, especially when Johan Nus’ choreography looks to Africa, such as in the joyful Gumboot Dance. The simple set is dominated by a scrim onto which large-scale naïve illustrations are projected. Virtually and rapidly painted or drawn, they represent the scenes’ settings or political circumstances and are ostensibly created by the character William (but are actually by Hadida). Behind the scrim, prison cells made of basic scaffolding are sometimes lit to form a secondary stage area, but most of the action is front and centre, with humble little platform sets sometimes wheeled in to help develop a sense of place. Sabrina Gomis Vallée’s costumes are mostly practical, but colourful African tribal styles and patterns catch the eye. Madiba the Musical is rather like that: something catches the eye, ear or heart occasionally, but you’re left wanting much more. The musical based on the wildly popular 2013 Disney film, best know for the hit song Let it Go, will have its Australian premiere season in 2020. A major retrospective of photographer David Goldblatt comes to the Museum of Contemporary Art Australia. Melbourne to host exhibition uncovering the human behind the activist. Before Sara Bareilles’ hit musical arrives, Sydney audiences will be treated to Chicago and Saturday Night Fever in 2019. Michael Grandage's warm-hearted production of a classic animation should thaw the frostiest of hearts. Amélie the musical is not quite as quirky as the much-loved film. With stellar cast and great music, The Book of Mormon is funny, irreverent and absurdly heartwarming. Baz Luhrman’s musical of his iconic film fares no better abroad than it did at home. Are Musicals The New Opera? Limelight’s Editor looks at Broadway’s operatic lineage from Monteverdi to Kurt Weill with a nod to Sondheim, Bernstein and Co.
Change and the artists who have been at the forefront of change. We look at Broadway’s operatic lineage with a nod to Sondheim, Bernstein & Co.
Partnership of leading man and character actress should excite the music theatre community. Funding problems have spelled an early end for Madiba: The African Opera. It may only take two to tango, but it takes more than that to make a great musical. The Sydney-based composer and arranger on translating the much-loved Australian film for the stage.